A delicate brooch of a plain, diamond cut cross in a gold finish. The brooch comes on a blue gift card, and is a precious display of faith. May the peace of God be with you always. Gold Cross Pin is published by CBC Distributors and is our 221st best seller. 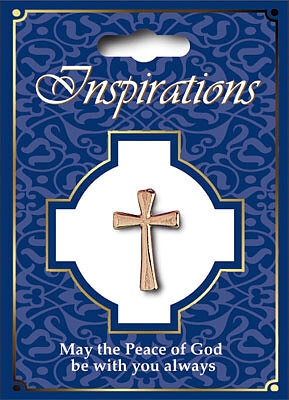 The ISBN for Gold Cross Pin is CBC1714. Thank you for providing me with this symbol of my Faith. More people should be encouraged to bear witness to their Christian beliefs without fear. Got a question? No problem! Just click here to ask us about Gold Cross Pin.